Would you like to feel a sense of peace and relaxation while making effective personal development changes? Personal development meditations have all the benefits of a normal meditation but also help to make vital changes to your thoughts and behaviours. Let’s say for example that you’re not feeling very positive at the moment. And then you run across this amazing personal development website that has a personal development meditation on which is specifically designed to increase positivity and flick the switch on negative thoughts. Are you feeling stuck or frustrated in life? To focus your attention on a particular subject, object or process. Guided visualisations where you use your imagination to walk through a rainforest or feel the sun’s warmth on the beach. Clearing the mind so you emerge from the meditative state feeling peaceful and relaxed with enhanced feelings of calmness. After a meditation you will feel more alive with a heightened sense of awareness. All your worries and stress from the day melt away. Meditation offers many health benefits. It is well known for reducing stress, calms the nervous system, reduces headaches, increases clarity of the mind, and supports overall mind and body healing. A personal development meditation can have all the benefits stated above but it is also focused on making positive changes to your thoughts and behaviours. I’m really excited you’re reading this! Why? Because I have something exciting to share with you. Meditation is not JUST about sitting cross-legged on a fluffy pillow. Meditation can be integrated into every moment of your life so you feel more fulfilled and satisfied. You’re encouraged to explore a variety of interesting styles of meditation so you can find the RIGHT-FIT MEDITATION routine that is perfect for your personality and lifestyle. You’ll love how some of these meditation styles will easily fit into your daily routine and even integrate nicely with your family and workplace. So, come on an exciting journey of meditation and I’ll show you how meditation can positively improve your life, reduce illness and dis-ease and bring you a peaceful state of mind. Download the MEDITATION WORKSHEETS in our SHOP to explore meditation from a variety of different angles. They can help you deeply love yourself, heal your heart, get rid of emotional baggage, reduce anxiety and melt away muscle tension, increase happiness and satisfaction and overall enrich your life to better living. 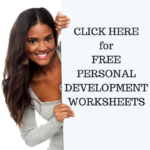 Sign-up to our blog to receive updates and more personal development insights. Read more about Why Personal Development?